Flames: solid-fueled (candles, campfires), liquid-fueled (e.g., oil lamps, kerosene and gasoline-fueled lanterns), gas-fueled (gaslights, acetylene lamps). These produce light directly from heat of combustion. Incandescent lights, in which electricity is forced through a solid wire filament that poses a resistance to the electricity. This causes the filament to be heated to an extremely high temperature. It's a basic law of physics that bodies radiate electromagnetic waves with a frequency spectrum determined by their temperature. At the extremely high temperatures of the filament of incandescent lamps, the waves emitted are in part in the visible light spectrum. Examples of incandescent lights include household light bulbs; older car headlamps; older flashlights, traffic signals and bicycle headlamps. Incandescent lights come in a number of variants, which go under the names of "vacuum", "krypton", "xenon", "halogen", and "quartz-halogen". Other than vacuum, these names describe gases inside the bulb which help to preserve the filament from deterioration and allow it to run at a higher temperature, producing more light. Even so, an incandescent lamp uses only a small percentage of the electricity to generate light; the rest is wasted as heat. As of this writing in 2018, incandescent lights are rapidly giving way to light-emitting diodes, which use far less electricity to generate the same amount of light, and which last much longer. Arc lamps, which use an electrical arc running through a gas plasma. Over a hundred years ago, it was found that if you touch two carbon rods hooked to a powerful electrical source together, some of the carbon will vaporize. If you then move the rods apart just a little, current will flow through this carbon vapor as a spark "arced" thru a gap between the rods filled with that vapor. This is the "carbon-arc" lamp. Though crude, open to air, and requiring constant attention to keep the gap between the rods proper as more and more carbon boils off the rods, the carbon-arc lamp produces a very intense and very pure white light. It's also more efficient in turning electricity into light than an incandescent. Carbon-arc lamps were used for many years in movie projectors. In certain senses, the carbon-arc lamp is the grand-daddy of today's mercury vapor, sodium-vapor, fluorescent, and metal-halide lamps, as well as neon signs-- all of which pass an arc through a gas or vapor contained in a glass bulb or tube. These lamps are described in more detail later in this article. Light-emitting diodes, which are solid-state devices that generate light by means of electroluminescence (electrical excitation of a solid-state semiconductor junction). Light-emitting diodes are a relatively new technology which has been used for indicator lights, traffic signals and bicycle taillamps since approximately 1990, but become practical for headlamps, room lighting and outdoor lighting only since approximately 2010. Some LEDs use phosphors to extend the range of colors they produce. This is typical with white-light LEDs. LEDS are highly efficient and long-lived. Lasers, which produce a narrow beam of light by means of a self-reinforcing "avalanche" of changed energy states in a gas or solid-state device. A laser may, then, work like an arc lamp or LED, except that the light is passed back and forth between two mirrors so that it can be reinforced as it passes. One of the mirrors is partially transparent to let the light out. Lasers have a multitude of uses, but when used for illumination, then mostly for laser light shows, laser pointers, surveying, targeting of weapons and other types of measurement. Unfortunately, lasers are inefficient, and produce monochromatic light, utterly useless for rendering colors. Thus, they have no place in the world of bicycle lighting other than for some gimmicky devices which project imitation bike lane lines on the road surface. Chemiluminescence. A chemical reaction generates light, as in "glow sticks" and some emergency lighting. The same phenomenon occurs in nature with fireflies and some jellyfish and mushrooms. The bicycle was invented in a time when flames produced all common artificial lighting. A candle lamp could alert road users to a carriage's approach, if the clatter of hoofbeats wasn't enough. Candle lamps also were used on early bicycles. The flame, in front of a curved reflector, was kept at the same location by a metal plate with a hole surrounding the wick, and a spring to press the lower end of the candle upward as the candle was consumed. Street and indoor lighting in cities in the late 19th century was commonly by gaslight, with gas produced by partial combustion of coal. Whale oil was widely used for lanterns until kerosene replaced it toward the end of the 19th century -- also saving whales from extinction. The photo below is of a kerosene headlamp from about 1895, on a restored antique bicycle. Kerosene lamps produced a dim, orange light. Soot would progressively coat the front window and reflector, reducing light output and requiring frequent cleaning. The fumes were annoying and unhealthful. Dripping water on calcium carbide generated acetylene case with a bright flame...This was, however, accompanied by a bad smell...Precarious situations could arise after a night ride if the wet carbide hadn't been used up and continued to generate acetylene...Upon getting home a cyclist usually put the lamp outside a window to let the carbide use itself up and the acetylene escape unburned into the air. With only acetylene lamps, fairly bright but tricky to use, or dim kerosene lamps, it is no wonder that organized bicyclists actually campaigned against laws requiring them to use a headlamp, and sometimes succeeded, as in a Massachusetts, USA law from the year 1900. This law instead required an alarm bell on a bicycle ridden at night, a weak alternative. It was possible to navigate the light of gaslight streetlamps or even by moonlight, though certainly with a considerable increased risk of collisions and falls. Bicyclists' resistance to using lights has been a recurring theme over the years and has affected laws, as in this early example, and led to extralegal behavior. Several carbon-filament electric bicycle lamps were produced before 1900, but vibration could break the fragile carbon filament. The acetylene lamp remained more practical than electrical lamps until the advent of the tungsten (metal) filament incandescent bulb, in 1911. The photo below is of a 1919 Mead Ranger bicycle with a tungsten-filament lamp and a #6 size dry cell slung under the top tube. (More about batteries later). Acetylene lamps continued to be produced long after incandescent bulbs became practical, being brighter and lighter in weight, but were never as convenient to use. They remained popular with cave explorers for decades. All common bicycle headlamps since the decline of the acetylene lamp and up through Marty's writing in 1997 used incandescent bulbs. Most made after 1980 employed a particular variant of incandescent bulb called a "halogen" bulb. The "halogen" variant has some gas in it that combines with atoms boiled off the filament and allows these filament atoms to be re-deposited on the filament later, providing for longer bulb life with hotter filaments. But they make light from electricity in the same way as other incandescent bulbs. The problem all incandescent bulbs is that they are very inefficient. The first incandescent bulbs made by Edison, which used a carbon filament, were around 1% efficient in turning electricity into light. As noted above, tricks such as putting halogen element gas into the bulb were employed to allow filaments to last longer, even when run hotter. In the somewhat more than a century since the incandescent bulb was first invented, efficiency of them has been improved from 1% to about 10%. The remaining 90% of the electrical energy poured into a modern incandescent bulb is turned largely into invisible infra-red radiation, which we know as heat. Thus, the "20 watt" halogen bulb used in a 1990s Night Rider bright beam is actually putting out 2 watts of visible light. The remainder of the battery power poured into that lamp is put out primarily as heat. Zinc-carbon non-rechargeable (primary) dry cells -- dry, as in only moist -- became available in 1898, and one is the power source in the 1919 bicycle in the photo above. The zinc-carbon dry cell was the common type used in bicycle lights until around 1980. The moist substance, the electrolyte, conducts electricity between the carbon and zinc electrodes and participates in a chemical reaction which produces electricity by consuming the zinc. When the zinc is exhausted, the cell is discarded. Technically, the term "battery" applies when more than one cell is used, though it is commonly used for a single cell. A common, cylindrical flashlight uses a battery consisting of two or three cells in series, one after the other. A rechargeable, or secondary, battery can be re-used many times, and is recharged by applying a reverse current to its terminals. Until the 1980s, almost all rechargeable batteries were lead-acid batteries. These are practical to produce large power surges, for example to start an automobile engine, but less desirable on bicycles: the electrolyte, sulfuric acid, is extremely corrosive -- it eats flesh; also, lead is heavy and highly toxic. .
Around 1980, alkaline cells, which are primary cells, became common. These use more complicated chemistry than carbon-zinc cells, and have a greater capacity. They have become the most common type of primary cells. The output of carbon-zinc, lead-acid and alkaline cells decreases slowly as they discharge, so the light dims bit by bit. New types of rechargeable cells more suitable for use in bicycle lighting have become common since 1980. Small, spill-proof lead-acid batteries with the electrolyte in a gel form, or in a glass-fiber mat, are more practical than those with a liquid electrolyte, though still heavy. 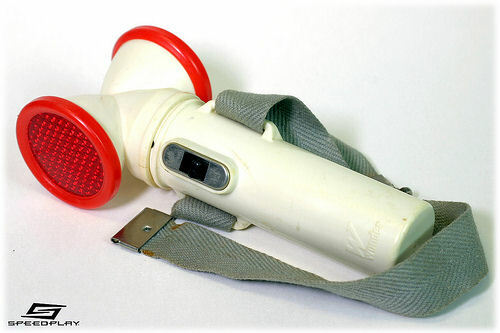 The nickel-cadmium cell, or nicad, was the first lightweight, compact rechargeable type, reaching the market around 1980. It could replace a carbon-zinc or alkaline cell in most applications. It would maintain its full output until nearly completely discharged, then quickly go dead, which can be an advantage or a disadvantage. A nickel-cadmium cell is easily damaged by overcharging -- or reverse charging when one cell in a multi-cell battery is weaker than the others. Also, cadmium, like lead, is highly toxic. Marty has an article comparing nickel-cadmium and sealed lead-acid batteries. Using similar chemistry but avoiding the toxicity issue, the nickel-metal hydride (or NimH, pronounced as the name of all the letters) cell, which became common a few years later, offered two to three times the capacity in the same package as a nickel-cadmium cell, and similar discharge characteristics. More recently, lithium-ion (or Li-ion) rechargeable batteries have become common, even dominant, in bicycle lighting. These have an even higher energy density then nickel-metal hydride batteries. And in addition, improved charging and battery-protection electronics have lengthened battery life and increased charging rates. Generators produce electricity by stealing a small part of the bicyclist's power output, as long as the bicycle is moving. Traditional "bottle-type" generators with a roller on the tire sidewall have been made for many decades, work as long as good contact is maintained, and are still manufactured. Bottom-bracket generators which roll on the tread were introduced around 1980 but are no longer in production. Generators built into a bicycle hub are preferred by long-distance tourists and randonneurs, who can't count on being able to recharge a battery. Hub generators are more efficient than bottle or bottom-bracket generators, and are uniquely silent and highly reliable, -- but the wheel must be built around the special hub. The pioneering hub generator, the Sturmey-Archer Dynohub, was introduced in the mid-1930s; and continued to be produced into the 1980s. The Dynohub was available as a front hub and in combination with a three-speed internal-gear rear hub. Due to the slow rotational speed of the bicycle wheel, power output, nominally 2 watts, was less than the usual 3 watts with a bottle generator. Special bulbs were necessary. 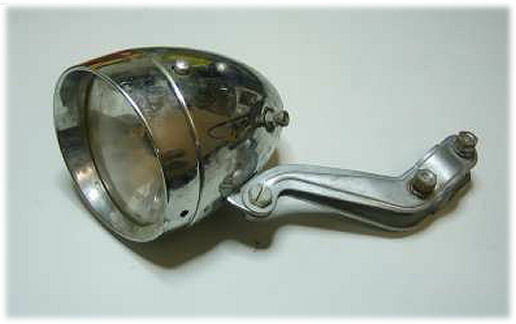 Sturmey-Archer designed a large headlamp with a focusing adjustment, to make best use of the power output. We have a page about classic Dynohubs. Since the turn of the millennium, improvements in magnets have led to the introduction of new hub generators, from several manufacturers. First was Busch & Müller in Germany, and there is also now a new Dynohub from Sturmey-Archer. These generators provide a full 3 watts of output like bottle and bottom-bracket generators. The high efficiency of light-emitting diodes now allows the headlamp in a bicycle-generator system to rival the brightness of car headlamps. Generator lights used to have two special problems. Power regulation was poor, achieved only by the generator's working against itself electrically at high speeds. Bulbs would blow out. And when the bicycle stopped, the lights went out. These problems have been solved with voltage regulator circuitry (generally, in the headlamp), and "standlight" power storage, which keeps lights shining while a bicyclist is waiting at a traffic light. Hub generators are also increasingly being used to power electronics, most commonly GPS units and cell phones. Small generators attached to the spokes and frame or fork power some novelty lights, and there is even a report of a tiny generator inside a rear derailer pulley, powering an electrical shifting mechanism. We have another page about bicycle generator system choices and installation. Solar cells may also be used to charge a battery on a bicycle, most commonly for GPS devices and cell phones. 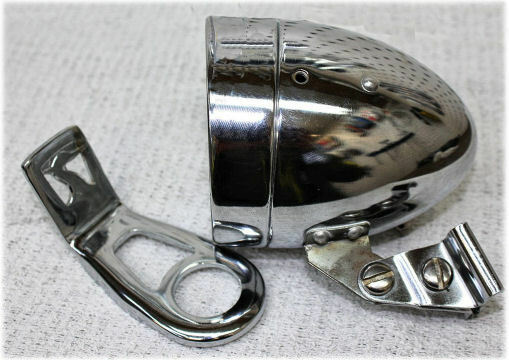 For several decades in the 20th Century, brackets like the one in the image below were installed between the headset upper race and top nut on high-end Raleigh Industries utility and club-rider bicycles, among others. The right-hand fork blade of many lightweight British club-rider and touring bicycles held a brazed-on nut to accept a similar bolt-on bracket. Many generator- and battery-powered lamps worked with these brackets. This was an excellent system, offering interchangeability and ease of installation. On heavy "cruiser" bicycles popular in the USA, a headlamp would often be mounted on the front fender. There was usually only a retroreflector facing the rear. I (John Allen) had a bicycle like the one in the image below (though red and much less shiny) when I was about 10 years old. It also had a battery-powered buzzer inside the tank, with a button on the side. The buzzer was meant to serve as a warning, like a bell or horn, though it wasn't loud enough to be of any real use, even when it worked. A headlamp mounted on the front fender or front rack was also common on fancy French touring bicycles. A taillamp might also be attached to a rear fender. This was common in Germany, where one brand of fenders even had foil embedded in the plastic to transmit electrical power -- clever, though not reliable. Typically, on other bicycles, a bottle generator with integrated headlamp would be clamped to a fork blade. 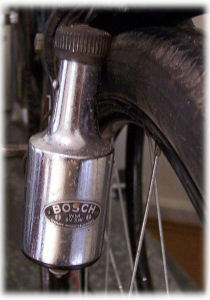 A headlamp bracket would attach at the front brake bolt or handlebar stem on a bicycle without the British lamp bracket. A generator integrated with with a taillamp would clamp to a seatstay. If rear pannier bags were used, the taillamp had to be somewhere else. In the USA, there was no standard way to attach a taillamp to a rack, and installation often required do-it-yourself work. The photo below is of the rear of my (John Allen's) Raleigh Twenty folding bicycle. Though the Pletscher rack has a tab with a bolt hole, I made angle brackets to attach a Union generator taillamp and large amber retroreflector out of harm's way under the top of the rack. The three watts of a generator system did not make for very bright light with an incandescent bulb: 2.4 watts for the headlamp -- and only 1.2 watts for the headlamp with the Dynohub. The Dynohub headlamp produced a narrow but tolerably bright beam for riding at a moderate pace once the eyes were dark-adapted, had a focusing adjustment, was rugged, with internal wiring connections, a switch underneath so water wouldn't collect, and a clip inside for a spare bulb. Street lighting in the mid-20th Century was neither a common nor as bright as it is now, and with the headlamps of the time, dark adaptation was both more likely, and more necessary. The British generator taillamp of the same era was a tiny thing clamped to a seatstay, dim due to the low power of the bulb, 0.6 watt, but to even more so due to the lack of a lens or mirror to focus the light. The efforts of the Cyclist Touring Club, the national cyclists' organization in the U.K. did not advance the cause of better taillamps. The CTC held to a legalistic position, that motorists should not overdrive their headlamps, and so a bicyclist shouldn't actually need a taillamp at all -- an example of the best being the enemy of the good. 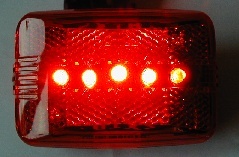 A white-painted strip was required on the rear of a bicycle fender in some countries, and it was common to require a small rear reflector. On the left below is a Raleigh Dynohub tailllamp and on the right is a BSA taillamp, sold with BSA's Dynohub imitation. The lettering on the BSA lamp is upside down. Why? Both of these lamps were mounted on the right seatstay in the U.K, under the assumption that they would be more visible with the bicycle on the left side of the road -- but in the USA, these lamps were mounted on the left seatstay. Even so, the rear wheel and fender could hide one of these lamps on a curving road, and a pannier would hide it too. 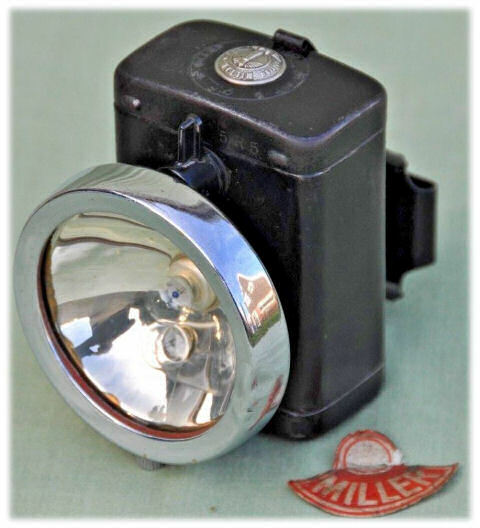 For many years, the usual battery headlamp consisted of a battery compartment holding two or three C- or D- sized carbon-zinc cells, a parabolic mirror behind the incandescent bulb, and a glass window at the front. As plastics came into wider use, plastic lenses were patterned to spread the light beam. The British Standard 6102-1 (1986) and the ISO 6742-1 lighting standard (1987) codified the advances which patterned lenses had made possible, getting much more useful light from taillamp bulbs, and spreading the headlamp beam. A taillamp which met this standard was visible for hundreds of feet to the rear, even with the feeble 0.6 watt bulb in a generator system. Plastic lamp housings also became common. The image below shows Berec (British Eveready) lights, common during the 1970s. 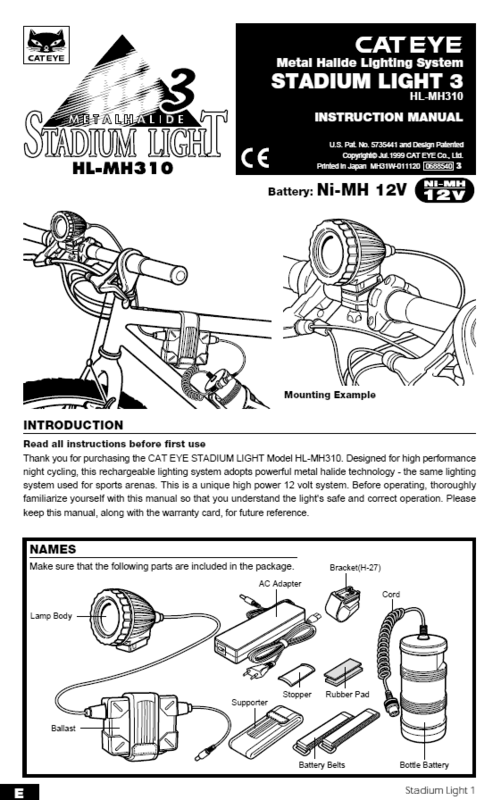 These attached in the same way as the Dynohub lights: the headlamp had a clip for a standard British headlamp bracket, and the taillamp clamped onto a seatstay. 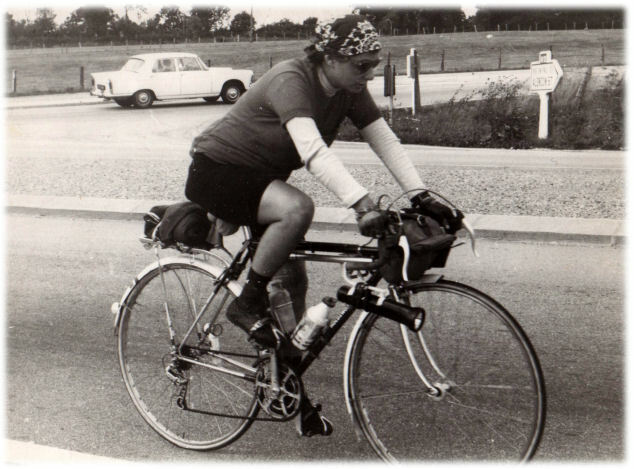 The photo below shows Harriet Fell, now the owner of this Web site, riding the 1200-km Paris-Brest-Paris ride in 1975. She reports that "[a friend] Claude gave me a wonderful flashlight holder he'd made and decided not to use. It plugs into the end of my handlebar." Also, Harriet had a Wonder leg light strapped to the bicycle in the rear dropout area, visible in the photo. The Wonder leg light usually strapped on just below the knee. It used a single bulb and two lenses -- red facing the rear and white facing the front. A spring at the bottom pressed the two C cells of the battery upward against the bottom of the bulb. The mass and weight of the cells allowed vibration to push the cells down, momentarily disconnecting from the bulb, and when they sprang up again, the upper cell would beat against the bulb, hastening bulb failure. Some people wore their leg lights upside down to avoid this problem. Harriet's flashlight quit just as she reached a rest stop on the PBP ride, but had revived -- with new batteries, she thinks -- when she left. She did not have as good luck on another ride, the Randonnée des Puy. I rode the Grand Parcours, 300 km - 4000 m of climb. The event started at 8 PM and finished at 6 PM the next day. My light failed at the contrôle at the top of the the Pas de Peyroll. I was kept at the top until first light - I think about 2 hours. I had spare batteries and bulbs but something must have loosened up in the flashlight and we could not get it working again. It was very cold and they gave me newspapers to stuff under my jersey. I did manage to finish with at least an hour to spare. I made it from there back to the train station in Clermont-Ferrand in time for dinner with my student, François Collongues, his parents and the other 5 riders from the Club Cyclosport du PTT, Bourg-la-Reine before our train ride back to Paris. In the late 1970s, the clamp-on Wonder Light was popular, despite two important weaknesses: it was available only with non-rechargeable batteries, and these were nonstandard. The Wonder Light could be attached to any bicycle, without the need for a special bracket or tools. 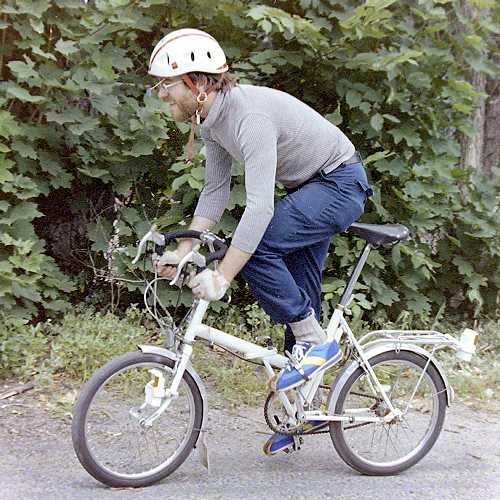 Most 1970s bike-boom moderately-priced imitation racing bicycles came without the British lamp bracket or any other standardized way to attach lights, and so a lamp which could easily be clamped to the handlebar had an advantage in the market. Wonder clamp-on light. Image courtesy of the Speedplay Museum. The photo below from 1980 or 1981, of John Allen, who updated of this article, shows somewhat more recent lighting technology. 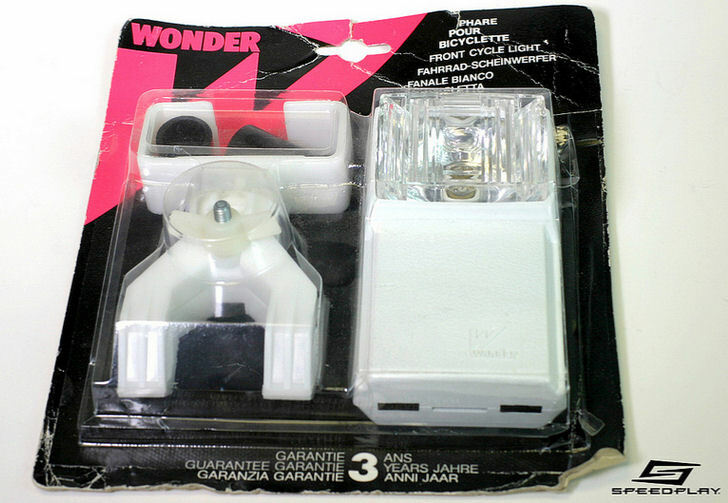 I was using Ray-O-Vac bicycle lights, like Wonder clamp-on lights except that they each used a pair of standard C-size cells. I purchased rechargeable nickel-cadmium cells at a Radio Shack store. These lights were adequate for around-town use, riding on streets with streetlights. The batteries held out for a couple hours, adequate for my urban rides, and had to be replaced once a year, more or less. On my touring bicycle, I had a bottle generator. The photo at the left shows one of the Ray-O-Vac lights, customized with an amber lens to be used at the rear of the bicycle. The lens was probably fashioned from a piece of a motor-vehicle lens found in the street. Amber was legal as long as the bicycle also had a red rear retroreflector. As long as they depended on incandescent bulbs, battery lights were dim -- suitable as marker lights but marginal to illuminate the road or path ahead unless powered by large, heavy batteries. It was possible to ride at a moderate pace on roads without streetlights with a generator system or one of the better battery headlamps, once the eyes had become dark-adapted, but dark adaptation was under repeated threat from the headlamps of oncoming motor vehicles. Often a motorist, unable to identify the small dot of light ahead, would switch on high-beam headlamps. I'd sometimes yell "dim it, dimwit!" in frustration, but that would have been unhelpful even if it had been heard, and it usually wasn't heard as the car rushed past. The dirty non-secret through all of that time is that many if not most cyclists did not use lights at all. Avid cyclists like Sheldon Brown, and Harriet, and me, used lights. We complained repeatably about near-collisions with cyclists who did not, and their effect on bicyclists' reputation. But casual cyclists found lights to be too much trouble, too unreliable, too expensive. Except in wealthy countries where bicycling was heavily used for transportation, police did not enforce lighting laws. Even there, use of lights was far from universal. The European study linked at the end of this article found that only about 70% of cyclists had proper lights at night. I don't know of a study in the USA, but based on observation, the rate was much lower. With the the exception of the Sturmey-Archer Dynohub system -- and imitator BSA, maybe others, the bicycle industry didn't offer practical, reliable solutions. Bicycle manufacturers' interest was in keeping prices down. In Germany, generator lights were required on new bicycles, but cheap and unreliable generator lights were the norm. In the U.K., lights were not required on new bicycles, though use of a headlamp was enforced to a significant degree. In the USA, from the mid-1970s onward, the industry succeeded in lobbying the Federal Government to require ten retroreflectors on new bicycles, facing in every direction and confusing many purchasers into thinking that they would reliably make the bicycle visible at night. The rear reflector was usually mounted on the seatpost or at the rear brake bolt, where it could be hidden by baggage on a rear rack. 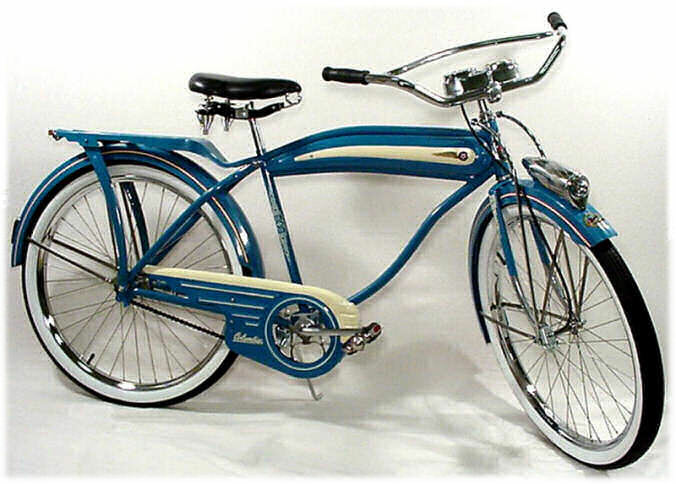 Most of the lower range of utility bicycles, as well as derailer-equipped bicycles of he 1970s bike boom, were sold without lights unless the customer specifically requested them. The laws of the states required a headlamp and a few states also required a taillamp at night, but this was the cyclist's responsibility. A kind of fatalism hovered over nighttime bicycling. People would wring their hands at the hazards of bicycling, yet not use lights. Edward Kearney, who served as Executive Director of the National Committee on Uniform Traffic Law and Ordinances (USA) in the 1970s, commuted by bicycle, partly on poorly-lighted paths, in the Washington, DC area. 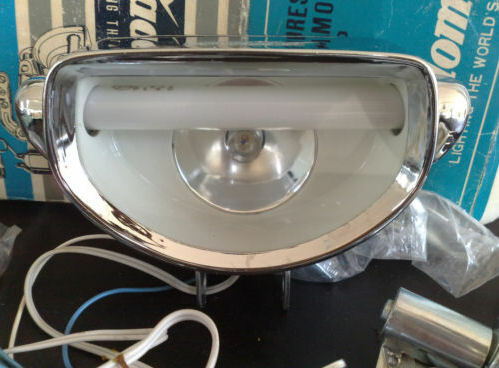 Unsatisfied with available bicycle lights, he quit his job to run a business, Bicycle Lighting Systems, which sold brighter sealed-beam headlamps like the one in the photo below. He had identified a small, sealed-beam unit which General Electric had marketed to bicyclists; later, he adapted a brighter sealed-beam unit which had been designed for use on farm tractors. 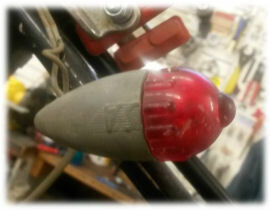 Kearney's were the first widely-available bright bicycle lights. They were expensive, and the gel-cell lead-acid batteries weighed a couple of pounds, but bicyclists who cared to have bright, reliable bicycle lights bought Kearney's lights. The round, yellow light in the video below is a Kearney taillamp, a repurposed barricade flasher. The case under the round lamp holds the lead-acid battery for both the headlamp and the taillamp. Another more modern flashing taillamp is below the Kearney light. The owner of these lights did not leave any reasonable doubt about being visible after dark. Kearney's lighting systems made use of repurposed parts. Other manufacturers (including NiteRider, VistaLite, Night Sun, BLT, Turbo Cat, and CatEye) followed in Kearney tire tracks, but using purpose-built components: smaller headlamps with the more efficient halogen bulbs, and lighter-weight nickel-cadmium and nickel-metal hydride batteries as these became available. Batteries were often designed to fit into a bicycle's water-bottle cage. 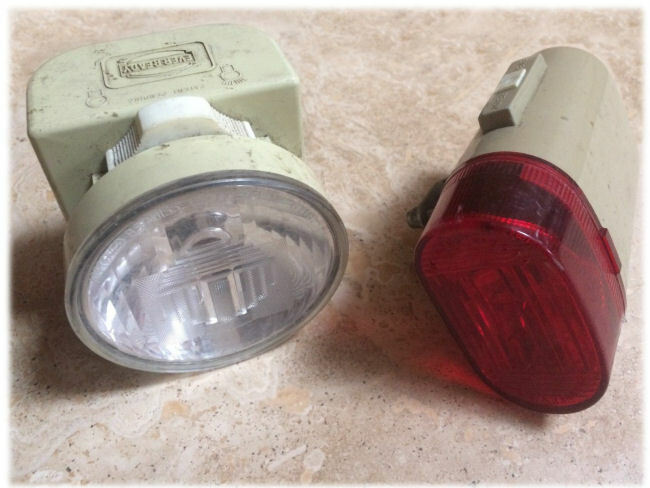 These lights sold to avid cyclists and with the rise of the mountain bike phenomenon, were especially popular for off-road riding. These lights were too expensive to appeal to casual cyclists. Marty wrote articles about some of these lights. Though the lights are obsolete, we are keeping the articles online for historical reasons, here and here. Before LEDs became practical, arc lights offered the highest efficiency. A couple were made for bicycles, but were never popular. They are of historical and technical interest. Arc lights are in common use for other purposes as this article is being updated in 2018. The world of arc lights can be divided into high-pressure arc lights (in which light is produced in a physically small bulb of high-pressure gases) and low-pressure arc lights, where a physically big tube of low pressure gas plasma is employed. Examples of high-pressure arc lamps include mercury-vapor lamps (which produce a bluish light), high-pressure sodium arc lamps (which produce an orange-yellow light), and metal-halide arc lamps (which are mercury vapor lamps with additional halides (salts) that produce orange and red light, so that the result is white light. All of these are found in street lamps, and industrial and stadium lighting. Examples of low-pressure arc lamps include fluorescent lamps, of the sort we often use in homes and offices, ultraviolet lamps, and neon signs. Fluorescent lamps use ultraviolet light to excite a phosphor on the inner surface of a tube, producing white light. Ultraviolet lights, used for their germicidal properties, in tanning parlors and discotheques, work like fluorescent lights, but leave out the phosphor so they radiate ultraviolet light directly. Neon signs use neon -- or other gases -- to produce a variety of colors. Carbon-arc lamps work in the open air and were until recently the usual light source for searchlights and for projectors in movie theaters.. In 1901, only a couple of decades after Edison introduced the incandescent bulb, a now-forgotten inventor named Peter Cooper Hewitt invented an arc lamp that used mercury vapor. The vapor was enclosed in a glass bulb. This was the first enclosed arc-type lamp using metal vapor. In 1934, a high pressure variant of this was developed, which could handle a lot more power in a smaller space. Mercury vapor arc lamps are roughly 20% efficient in turning electricity into light. Unfortunately, their light is particularly cold, harsh, blue-green in color. Still, because of their efficiency, they were used for a long time in street lamps. The low-pressure mercury-vapor arc lamp of Peter Cooper Hewitt is the very direct parent of today's modern fluorescent lights. It was found that these low pressure arc lamps would put out large amounts of ultraviolet light. Folks then figured that if they coated the inside of the light bulb with a fluorescent chemical (one that absorbed UV light and re-radiated that energy as visible light) they could make an efficient light source. Early fluorescent lamps used beryllium in their fluorescent material, creating a horrible toxic waste situation (beryllium is hideously toxic to the lungs when inhaled). But later this was replaced with safer fluorescent chemicals. Combined with modern electronic technology, the latest fluorescent lamps are as much as 40% efficient in turning electrical energy into light. But, they can't be made to produce a bright point source of light that can be focused into a nice beam for bicycling, so this technology is not of much interest for bicycle lighting. Nonetheless, the 1970s Kadomax light shown in the picture below used a small fluorescent tube for wide coverage -- but also, an incandescent bulb for a spot beam. A special bottle generator produced 100 volts and 4 watts for the fluorescent tube, and the usual 6 volts and 3 watts for the incandescent headlamp and taillamp bulbs. I (John Allen) recall another product from the 1970s-1980s with a small fluorescent tube mounted on the bicycle's downtube. This helped make the bicyclist visible but was of little use to light the bicyclist's way. Further experimentation with metal-vapor arc lamps resulted in the high-pressure sodium lamp. This produced a distinctive yellow color of light. High-pressure sodium metal-arc lamps have been designed to be very efficient. Some can turn over 50% of the electrical power put into them into visible light. Their yellowish light is much more psychologically warm and pleasant. They replaced mercury vapor in streetlight applications. A different type of sodium-arc lamp, the low-pressure sodium-arc lamp, is the most efficient arc lamp known today in turning electricity into visible light. These can be made to have a staggering 80% efficiency in turning light into electricity. However, these are physically big bulbs, and cannot be used to produce a bright point source of light that can be turned into a useful beam for bicycle and automobile applications. Worse, their light is a pure monochromatic yellow, which literally cannot render colors AT ALL. This has greatly limited the number of applications of this highly efficient lamp. Around 1960, General Electric began to experiment with more complicated mixtures of stuff inside of mercury arc lamps, in order to get better efficiency and a more pleasing, white color. Starting with mercury metal vapor, GE added iodine salts of other metals (indium, scandium, sodium, and thallium). Iodine is one of the halogen elements, and thus a compound of a metal and iodine is called a "metal halide" salt. By 1962, GE had applied for patents on this variant arc lamp, called a "Multi-Vapor Metal-Halide" lamp. The "Fountain of the Planets" at the 1964 New York World's Fair was illuminated by GE's new metal-halide lamps. Metal-halide lamps are more efficient than their parent, the mercury-vapor arc lamp. They can be as much as 50% efficient in turning electricity into light. They tend to not be quite as efficient as the high pressure sodium-vapor lamp, but they put out a much more white light. This white light does tend to be somewhat biased toward appearing a bit bluish. These lamps have in places replaced sodium lamps for use in street lights. The problem with using any of the arc type lamps is that you need very high voltage to start up the lamp...up to 6000 or more volts. Then you need moderately high voltage to run the lamp, in the range of 100 or so volts. Early mercury, sodium, and metal-halide arc lamps also took a while to get to full brightness...as much as 5 minutes. When turned off and turned on again, some would take even longer to reach full brightness...up to fifteen minutes. They also were made only in relatively high wattage (200 or more) versions. For all these reasons, they were not available for use on bicycles or cars, where only a 6 or 12 volt DC source of power was available, and where there's a need for very rapid turning on and off of the lamp. In the 1970's and 1980's, new developments in electronics (integrated circuits, microprocessors, MOSFET power transistors, and designs for ultra high efficiency "switching" power converters) set the stage for development, in the 1990's, of mass produced, inexpensive electronic chips and circuits dedicated to turning 12 volts DC into the 100 to 6000 volts to drive a metal-halide arc lamp. Such chips were devised to sense the condition of the lamp, and to allow safely forcing it to full brightness far faster than the older arrangements for arc-type lamps. Such power conversion is not 100% efficient, of course, but it is staggeringly close to 100% (around 90% or so). The small losses in the power-converter circuit are more than made up for by the greatly increased efficiency of the metal-halide arc lamps. With this technology available, refined metal-halide light bulbs were produced in the 35 watt range. These bulbs put out light equivalent to 140-watt halogen incandescent light bulbs. The combination of these smaller metal halide arc lamps and the new electronics for running them off 12 volts was installed in top-of-the-line Porsche and BMW automobiles. Marty commented: "It's possible that, as the cost of this technology decreases, all automobiles will eventually use metal halide arc lamps as headlamps." But improvements in light-emitting diodes obsoleted metal-halide bulbs for car headlamps within a few years. The same is true for the bicycle headlamp to be described next. The heart of the CatEye Stadium was its metal-halide bulb, a completely different technology for turning electricity into light than that used by other bicycle lights. Do not confuse "metal-halide bulb" with "halogen bulb". The two may sound alike, but they denote utterly different technologies in lighting. CatEye was the first maker of bicycling equipment to attempt to utilize this dramatically far-superior technology for a bicycle lamp. Marty had no formal connection with CatEye, but he had to salute CatEye's courage and vision in attempting to bring this technology to cyclists. CatEye obtained a 21-watt metal-halide arc bulb, and used the same electronics as in $120,000 BMW and Porsche car headlamps. CatEye packaged this in a fashion that physically looks like an ordinary bicycle lamp. The lamp was, however, about four times as efficient in turning light into electricity as all previous bicycle lamps except maybe for the Kadomax fluorescent. The Stadium light was equivalent to a 70- or 80-watt halogen bulb. CatEye combined this lamp with a very carefully thought-out reflector (CatEye's specialty is reflector design). With vastly more light available, night bicycling is qualitatively far safer. The road can be lit both farther ahead and, even more importantly, far more brightly to the sides of the bicycle. It was Marty's impression as of 1997 that CatEye's Stadium lamp represented the technology of bicycle light that would eventually replace all of the existing incandescent bicycle lighting systems in serious off-road and touring bicycling applications. It was not just a little better. The difference was like the difference between night and day. As the illustration above shows, while the light itself was compact, it required two additional units attached to the bicycle -- a nickel-metal hydride battery which occupied a water-bottle cage, and a ballast hanging under the top tube. Life of the battery on a charge was only about one hour, and the supplied charger, like most which were available at the time, could overcharge and damage the battery if left connected for too long. As of 2018, replacement bulbs for the Stadium light are no longer available. But light-emitting diodes now offer as much brightness, with far fewer complications. As long as they depended on incandescent bulbs, battery lights for bicycles were suitable as marker lights but inadequate to illuminate the road or path ahead unless powered by large, heavy batteries. Arc lights were bright, but complicated and expensive. Light Emitting Diodes (LED's) are among the most efficient devices for turning electricity into light, rivalling the efficiency of low-vapor sodium lamps. Like incandescent lights, they have the advantage of running directly off low voltage batteries without the need for fancy, expensive electronics to convert voltages. They are totally "solid state" devices, and last many times longer than an incandescent bulb. In 1997, though, they were practical only for taillamps. Red is the easiest color to produce with a light-emitting diode -- due to quantum physics: the energy level change to produce a photon of red light is smaller then for the other visible colors, same reason that red hot is less hot than white hot. Also, a taillamp does not need to be nearly as bright as a headlamp. 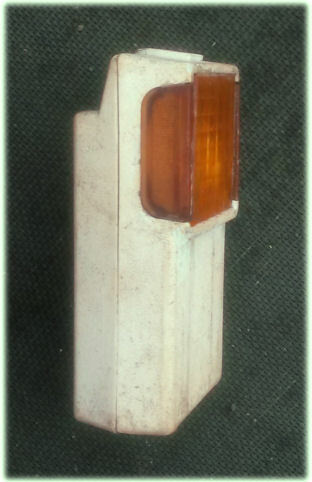 The Vistalite was the pioneering LED taillamp, and LED taillamps were quite common already in 1997. For a couple of decades, it was common to see bicyclists riding with a taillamp and no headlamp, because LED taillamps were practical and economical while headlamps were still either expensive or dim; also, many bicyclists labored under the misconception that the only important collision risk against which a lamp could protect was from an overtaking motorist. In developed nations, most bicycling occurs under streetlights, and the misconception was (and still is) also common that the ability to see ahead means also that the bicyclist will be seen. With many types of bicycle equipment, new technical developments have not necessarily been for the better. The increasing number of sprockets in a cassette, the shift from steel to aluminum, titanium and carbon fiber frames, the advent of disk brakes all have their advantages, and novelty appeal which can sell bicycles, but with a trade-off in cost, durability, repairability and/or reliability. On the other hand, improvements in batteries, the revival of hub-generator production, and above all, light-emitting diodes, have transformed bicycle lighting, making it at long last simple and practical, even at a low price point. Light-emitting diodes, along with improved batteries, now (as of 2018) allow compact, lightweight battery-powered lamps to be as bright as automotive headlamps, with a a battery discharge life of two hours or more -- entirely adequate for an evening's commute home after dark. LED headlamps powered by ordinary 3-watt hub generators are as bright and without the running-time limitation. While an incandescent bulb's filament heats and cools too slowly to maintain full brightness during the peaks of a rapidly-switched input., LEDs lend themselves to electronic control of brightness and avoid burnout from overvoltage, usually by switching them on and off at a rate too fast for the eye to detect. Battery-powered bicycle headlamps can be bright to the extent that many pose a glare hazard to oncoming bicyclists and motorists. The best LED headlamps conform to German standards, with a controlled beam pattern. We have another article with detailed information about today's LED headlamps.